We went to Ayuttaya on the 3rd day in Bangkok. Just want to share few photos taken there. My hubby's purpose was to pray in temples there. He is always in believe of God to greet for success in his career. See how holy he was!! As for me, I prayed for a beautiful and healthy skin for both my kids. It was sunny and hot. We then went for fish feeding. Those were 'giant' catfish! Mind your steps, once fall into the pond, you are finished! They were really hungry at all time! View of the villages across the river. 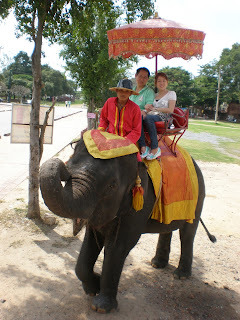 Elephant ride....scary and worried as that was my 1st time.